Imagine my surprise when I got the recipe for Turkey Cheddar Rice Bake, circa 1995, and it didn’t include any cream of mushroom soup. I distinctly remember a gooey pile of rice, vegetables, and poultry steaming on my plate, perfected by a top crust of bubbly cheese, and I would have bet anything that, to healthify it, I would have to come up with a substitute for the iconic COM (Cream Of Mushroom–I’m on an acronym kick lately, beginning with the FGLs). For days, literally, I had been contemplating and researching solutions for a liquid that would hold everything together without necessarily congealing it into an impenetrable block, and a roux or cheese sauce was really the only thing I could come up with that would be thick enough. In my memory, and as I baked up test batches (as in, the multiple pans that now fill my freezer), I envisioned this perfectly tight square piece of the bake, sharp corners and all, sitting nicely on a plate as I snapped a few, or 83, photos. That’s not exactly what happened. First of all, try cutting cleanly through big broccoli chunks–they refuse to participate in any of that, which is why it’s important to cut the florets fairly small before baking. Second, think about another favorite recipe that includes a sauce with a roux (if you’re unfamiliar, the roux is an equal mixture of fat and flour, cooked over heat, which thickens the sauce when you add liquid), such as cheese sauce for mac and cheese (bad example: my roux-less version). When you scoop it out of the pan and onto your plate, does it stay nice and compact in a perfectly cut square? Not that I recall, so I guess I was just being…creative…in my expectations for the form of the bake. 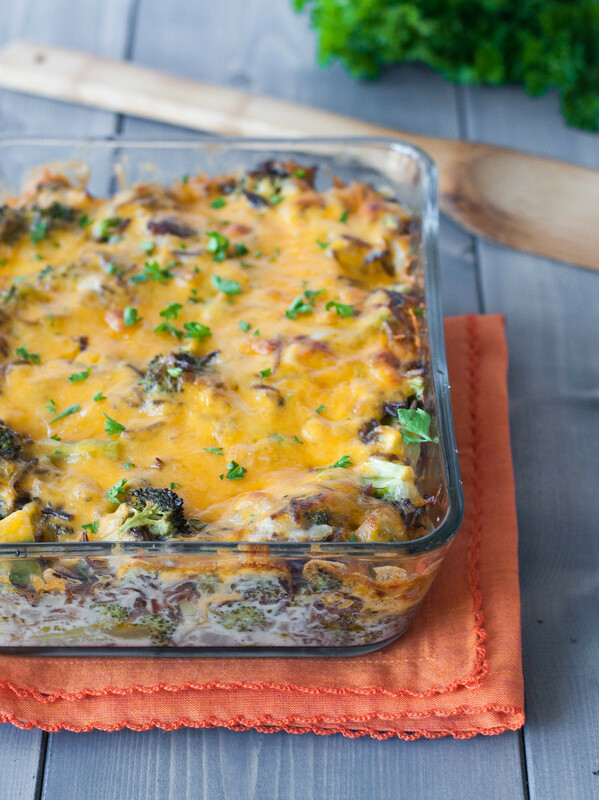 The good news is that this broccoli cheddar rice bake is everything (else) I hoped it would be; quite possibly more. One bite was all it took for me to let go of my hangup with the (lack of) shape, and I’ve embraced the “pile” in all its goodness. It’s so much like the hot dish I had years ago, yet so much different. The creamy, slightly sweet sauce, reminiscent of the original, is thick enough to coat the short list of updated components, yet not so thick as to overpower the taste of each long grain of wild rice. My goal with the recipe makeover was to 1) make it meatless, because meat wasn’t even a memorable component of it for me and 2) keep it free of processed ingredients. Another surprise in the original recipe was that it actually did feature turkey, probably because the creamy, starchy rice-veggie-cheese mix is more than you could ever want all on its own, end of story. If you’re concerned about missing protein with the removal of meat, it might interest you that wild rice has more protein than other types of rice. 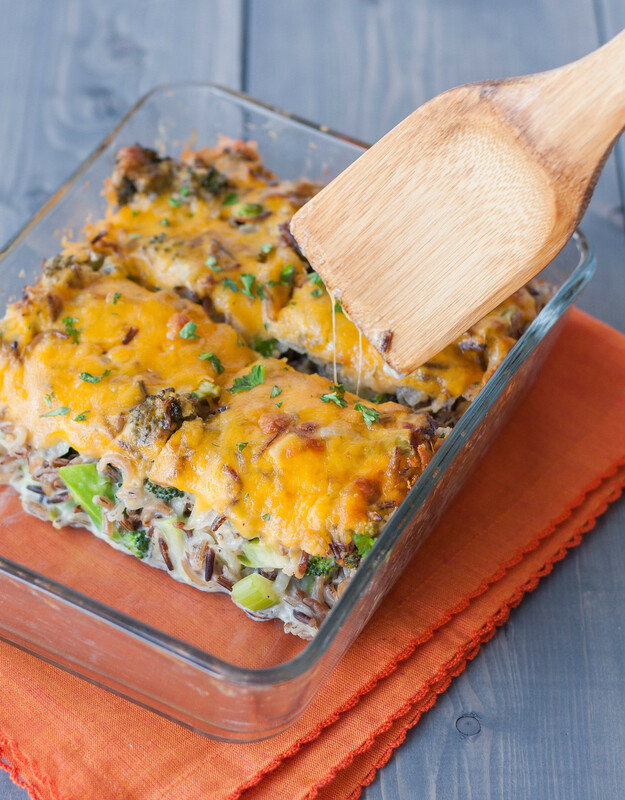 No, I didn’t do that on purpose, but I love wild rice (Minnesotan to the core) and it adds so much texture to this bake, so the protein perk is just icing on the cake. Starting with a roux-based sauce made steering clear of super processed foods simple. There is less than a quarter cup of flour, which I find necessary to include when going for the perfect bechamel (That’s code for “white sauce”. Try it to sound fancy.). If you have a great, 1-for-1 gluten-free thickener for this, let me know. I’ve tried a couple without great results. I did away with bouillon cubes, which scare me a little, and replaced them with homemade-optional stock or broth. I kept the dish meatless, but during my testing all I had on hand was chicken stock. You’ll see that the recipe specifies vegetable broth as an option, and it should substitute perfectly to keep it vegetarian (note that there are obviously still dairy products included). 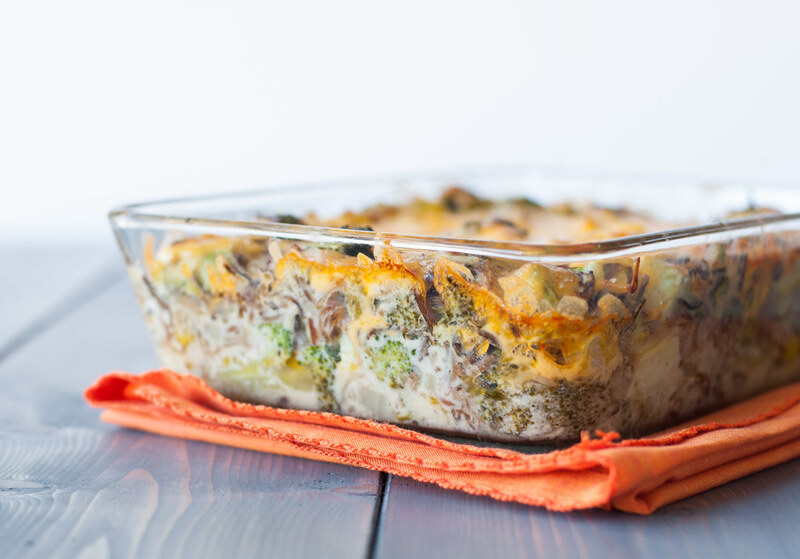 If you have fall sports or any kind of athletic endeavors going on this season, you should be aware that I’ve tested this broccoli bake with a big appetite, fueling with it both before and after my first live yoga class in a long time. I’ve been practicing yoga in the comfort of my living room for months now with Adriene, and I felt pretty good going into the class. A lot of the flows and poses were familiar, so I could relax and fit right in with the class regulars. I’m not, however, used to a 78 degree room (I know, not even hot yoga), so I sweat up a storm, and, for the second day in a row, I can barely walk. Yeah. So maybe I’m not quite as much of a pro as I thought, but that’s why we PRACTICE! I used to be a big runner, and I’d still like to return to it and fulfill my goal of running a marathon (or two! ), but at this time in my life, when I’m still doing some bigtime exploring after leaving my first career, learning new skills at rapid pace, and figuring out how to turn what I love to do into my job, yoga is much more centering and empowering for me. 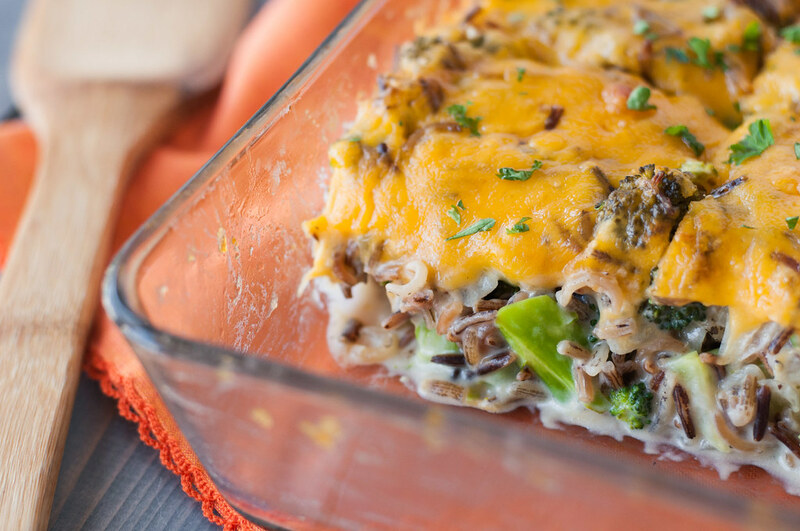 It helps me relax about things like the structure of a serving of broccoli cheddar rice bake. Plus, much to my surprise, when I challenge myself with more difficult and new poses (like headstands! ), it keeps me super strong and my weight hasn’t really budged (much), even when I’m pretty much taste testing things half the day and eating two of every meal. Not having to go up a jeans size amidst all that eating–hallelujah. 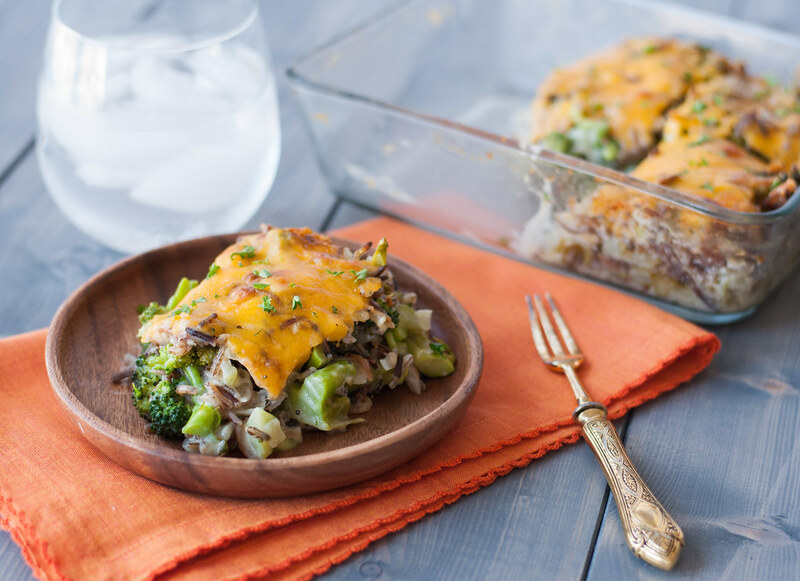 Whenever you decide to try out this broccoli and rice baked goodness, do me one favor of serving it with a big spoon, not a spatula, and just expect a not-so-pristine looking mountain on your plate. I promise you, it won’t be there long. While I drafted the recipe and ingredients on my own, they turn out to be quite coincident with a recipe from Smitten Kitchen. Unlike me, she wasn’t raised with the traditional dish, and her theatrical account of the evolution of her version is quite entertaining. Don't be intimidated by the sauce in this recipe--a roux is more difficult to ruin than you think! 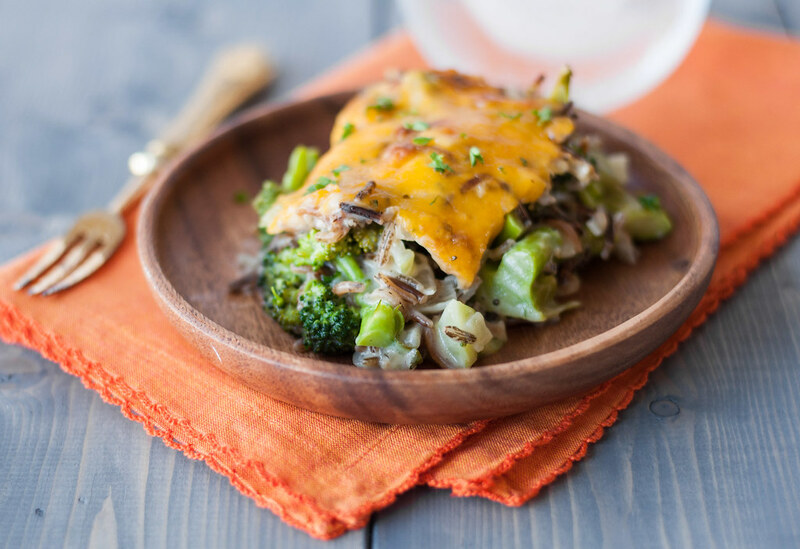 The end result will be more than rewarding--high protein wild rice and roasted broccoli smothered in that slightly sweet, creamy sauce and bubbling with melted cheddar. Preheat oven to 425. In a small casserole dish (1½ to 2½ quarts), toss broccoli pieces with 1 tablespoon olive oil, then sprinkle with ¼ t salt and a pinch of pepper. Roast in bottom third of oven for 5 minutes, until just tender with some crunch in the middle. While the broccoli cools, make the sauce. Scald milk in a small saucepan by heating it over medium until tiny bubbles form around the edges (see notes). Cover to keep warm. Have broth ready close to room temperature. Melt butter over medium heat in a medium saucepan, then add onions and cook until softened, 4 to 5 minutes. Add flour and mustard powder and stir constantly with a wooden spoon for 3 to 4 minutes. Turn off heat, slowly whisk in milk until incorporated (see note—no need to rush or panic), then whisk in broth. Increase heat to medium high so the sauce comes to a simmer (turn down heat if it starts to simmer really rapidly), then simmer, stirring constantly with a wooden spoon or spatula, until thickened, about 8 to 10 minutes. When sauce is done, turn off heat and stir in celery, 1 teaspoon salt (or more to taste), and pepper to taste. 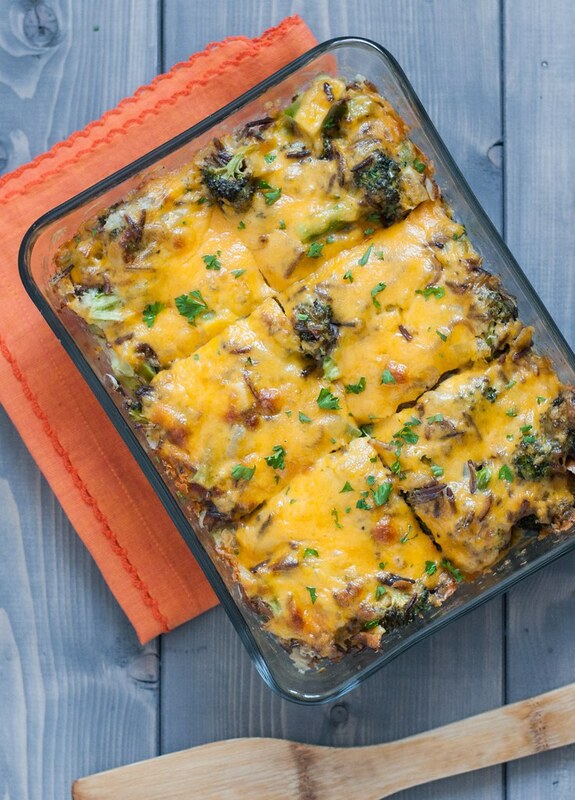 Mix broccoli and rice together in the casserole dish used to roast the broccoli. Pour sauce over then stir to incorporate. Top with grated cheddar. Bake at 375 on middle rack for 20 to 25 minutes, until cheese is melted. Broil the cheese for a few minutes at the end to brown the cheese, if desired. Let stand for a couple minutes, but serve hot so the cheese doesn't firm up. To substitute stock for broth, strain ⅓ C through cheesecloth or a coffee filter, then mix with ⅓ C water. When adding liquid to the roux, it’s easiest to be able to hold the pan when both pouring and whisking. Unless you have 3 hands, here’s how to do it: drizzle in a quarter of the milk, put the pan with the milk down, then whisk to completely incorporate. Repeat three times, alternating your “good” hand between holding the pan while you pour and using it to whisk. Don’t be afraid to take your time. The roux and milk won’t go bad if you have the heat off for 5 minutes. It’s harder to ruin than you think. Of the cook time, 25 minutes is included for cooking the rice. Total time will be shorter if you cook the rice in advance. Except for the residual oil from the broccoli, there's no need to grease the pan. I actually forgot the first time (using a glass pan), but nothing stuck. Always looking for healthier options, but ones that taste good. Will try this. For thickener, I really like potato flour. You just have to be careful it doesn’t get lumpy. Thanks for the suggestion! Will add that to my list of kitchen testing. 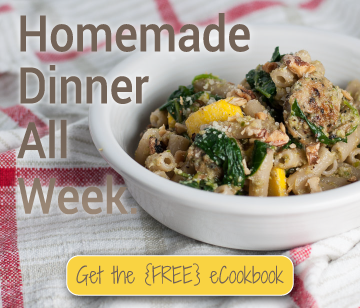 I made this for dinner last night – it was a HUGE hit!